I worked out the other day that I must have worked my way through close to 1,000 VHS tapes throughout 2017 in search of interesting nuggets of British TV. Obviously, I don't scan every single millisecond of the tapes as that would be ridiculously time consuming, so the fast forward button helps me skip through the late 1980s editions of Blind Date and get to the interesting bits like ad breaks and whatever followed when the tape was left running. It's an endeavour that I'm planning to continue next year even though it can sometimes drive me mad. Earlier on in the year I picked up close to 150 tapes in one go and about 98% of the tapes had what can only be described as mid to late 1990s drivel on. And it was almost all recorded in Long Play, so the quality was abysmal. However, I've also picked up some collections of tapes which had had a much higher 'find' ratio, so I guess you have to take the rough with the smooth. One plan for 2018 is to invest in a Betamax player, so I can start going through these 'curiously smaller than VHS' tapes. And, in fact, I've already picked up a collection of about 25 Betamax tapes (see above). Unfortunately, a fully working and refurbished Betamax player is around £250 to £300 so this may take some saving. If anyone wants to help donate towards the purchase of a Betamax player then get in touch and if the funds are raised then I'll sort out some perks such as DVD copies of found material. I did look into doing a Kickstarter, but the copyright infringements meant they couldn't host it. For now, I'm pushing forwards with VHS exploration - as ever, I'm always looking for tapes from the 1980s you may have knocking about - as I've found some interesting bits and pieces this year (and some missing material which has been forwarded onto Kaleidoscope such as HTV in-vision continuity and episodes of Granada Reports). Anyway, here's my latest lot of finds since the last update! Enjoy! Airing on BBC1 throughout the 1970s and 80s, Day Out centred upon potential days out the Great British public could take - with an emphasis on the Midlands and South West. This particular episode, from towards the end of the series' run, finds Angela Rippon heading to Symonds Yat to experience the delightful attractions and activities on offer. I picked up a box of tapes several weeks ago which contained seemingly endless editions of Lovejoy and The Antiques Road Show which, whilst lovely slices of British TV, aren't exactly what I'm looking for. 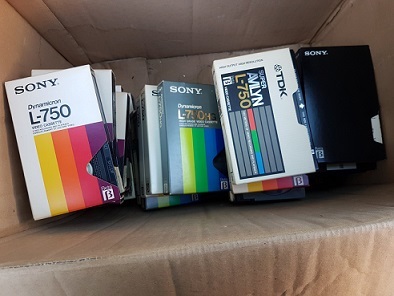 Thankfully, in amongst these tapes were a number of tapes which had come from a secondary school and contained many early to mid 80s schools programmes. There was an emphasis on media studies programmes and this episode looking at Minder and it's demographic was probably the most interesting one. It may also be missing from the Thames archive (or at the very least, mislabelled) so this has also been sent to Kaleidoscope for posterity. All of the tapes appear to be second generation copies, so the quality isn't as sharp as I would like but it's more than watchable. It's always good to find a TV show which contains the surrounding continuity to get a real flavour of that day's viewing experience, but when you get the news included as well it's an amazing time capsule. And that's exactly what I found squirreled away on a Fuji tape. So, not only is there an episode of Storytime, but we also get the day's news with Jilly Carter and the weather with Michael Fish. What more could you want? A winning lottery ticket? Well, maybe. Nestling at the very end of a tape, I found that the owner of this particular tape had left their VCR recording after a film had finished (one of the best sources for finding strange snippets of TV) and inadvertently recorded this episode of supernatural/horror anthology series Worlds Beyond. As ever, there was a slight hint of nervousness as I fast forwarded through the episode - titled 'Home' as it was getting close to the end of the tape and there's nothing worse than ending up with a partial episode. Thankfully it was all there with a few seconds to spare, so here it is nearly 30 years after it last aired. Complete with Thames in-vision continuity, which is always a bonus! There's precious little footage of Mooncat's two series Get Up and Go! and Mooncat & Co online, but thankfully I've been able to boost the available footage with this episode from the final series of Mooncat & Co. It's a rather plaintive and poignant episode which finds Mooncat lamenting his mate Stephen who has departed the series (yet remains in the opening credits), but still remains a fantastic example of just how good Mooncat was. If anyone else has Mooncat footage then please get in touch! Weekend - which was only ever broadcast in the Granada region - was presented by Paul Jones (yes, he of Manfred Mann fame) and took a look at the upcoming attractions in the region such as exhibitions, new films at the cinema etc. This particular episode featured interviews with Adam Faith and Frankie Howerd, but sadly the clip I found was only six minutes long. Still, it's a nice look at a rarely seen TV show. I find the introduction to that Day Out programme unintentionally hilarious. The word is not 'u-bend', Angela...it's meander. A u-bend is something ...a bit different. Yes, meander is a far superior (and correct) description. Perhaps Angela was having trouble with her plumbing at the time?